… is something that I have trouble with. I tend to replay the unhappy events and mistakes in my mind over and over and morally punish myself. The cure was given around 2000 years ago by our planet’s Master and Saviour Jesus Christ. The Gospel is the treatment for all our infirmities. The duty of our conscience tells us to forgive, to overcome bitterness, to develop humility and charity. When we do not fulfill our duty, it creates disharmony within ourselves, as well as in our surroundings. Trying to escape our duty creates suffering. Suffering is a warning sign telling us that we are doing something wrong. The function of the pain is to prevent us from continuing down an erroneous path, before the consequences of our behaviour gets even worse along the way. Guilt freezes the energy that is meant to be used for our moral progress. It is important not to feed guilt. When we make mistakes, let’s look back, not to feel bad about it, but to learn the lesson and act better from now on and not make the same mistake again. In order to do this, we need to watch and pray. Adjust the sintony every moment of the day. Not leaving any space for bad thoughts. Guilt needs to be replaced by a sense of responsibility. Getting up to practice charity, working to repair the damage that we caused. How long do we suffer from our wrongdoings? 1004. What decides the duration of the sufferings of the guilty? It depends on the time it takes us to become better. We can either lay down and crumble under the weight of guilt, or we can get up, work to repair, practice charity, work on our inner moral transformation. With a guilt complex, we sometimes think we need to punish ourselves. Knowing that God is the infinite love, what do you think he prefers? or that we get up and initiate the process of reparation, trusting in the divine love and mercy? This parable is a marvelous lesson. Did the father ever condemn his son? No. He waited patiently for him to come back and welcomed him with open arms, running to greet him! And threw a big party for him! How can we not expect infinitely more from God! Paul: the famous meeting with Damas before the gates of Damascus. Instead of breaking down with guilt, he asked: “Lord, what do you want me to do?”. And from that moment on, he worked tirelessly with total dedication for Jesus and charity. Peter: after negating Jesus three times, did Jesus blame him for doing so? No, he gave him three opportunities of recovering by asking him three times: “Peter, do you love me?”. Three mistakes and three new chances. Perfect love does not judge. Perfect love is unconditional. There is absolutely nothing we can do to make God love us any less. God’s love is infinite and perfect. So, let’s love! Let’s remove the barriers that prevent us from from feeling God’s infinite love that irradiates and fills the whole universe! Much pain in our lives comes from us resisting changes. Resisting doing what we know we should do. Let’s learn from our past, focusing on the goal: God’s project for the ultimate happiness, for everyone of us! Why do we stay in the prison of guilt, when the doors always were, and always will be, open? So next time I feel tempted to feel bad about a past mistake, I’ll think about God’s love and the parable of the prodigal son. Jesus gives us all the courage to get up, work, repair and improve. All the tools are our hands. The cure is the Gospel. What is duty? Does it affect us? Do we need to do anything about it? Let us have a few considerations on this topic, based on the Gospel according to spiritism, chapter 17, item 7. Duty is a moral obligation, firstly to ourselves and then to others. Duty is a law of life encountered in the smallest details as well as in the most elevated acts. Now I wish to speak only of moral duty and not of that duty which refers to the professions. Duty concerns everyone, it is a universal law of life. From the smallest things to the greatest ones. Not only in professional life but in each and every one of our behaviours. Within the order of sentiments, duty is a very difficult one to fulfill because it finds itself in antagonism with the seductions of interest and of the heart. Our imperfect tendencies, our vices and our own interests often prevent us from fulfilling our duty. But how can we know what our duty is? What should we do? The pressure of Man’s conscience, this guardian of interior integrity, alerts and sustains him, but shows itself frequently impotent against the deceptions of passion. Our conscience tells us what is right or what is wrong. The laws of God are written in our conscience. However, we often drown this voice with our desire to satisfy our passions. Where does duty begin? Where does it end? Duty begins exactly at the point where the happiness or tranquility of our neighbour is threatened, and therefore terminates at the limit we would not wish to be passed in relation to ourselves. As a general guidance, we should not go too far in a way that would hurt our neighbour. Before doing something, we should ask ourselves if we would like it if someone else were to do this unto us. If our answer to this question is negative, we should refrain from this action. God has created all men equal in relation to pain; whether we be small or great, ignorant or educated, we all suffer for the same motives […]. Equality in the face of pain is God’s sublime providence. He desires that all of His children, being instructed through their common experiences, should not practice evil with the excuse of not knowing its effects. Knowing how painful some things are, we should not inflict them upon others. We do not have the excuse of not knowing that something is bad if we experimented its effects. If we act badly toward others, we may receive the same kind of offense in return, as an educational experience. The man who fulfills his duty loves God more than his fellow beings and loves his fellow beings more than himself. This is the ultimate goal of duty, this is where it leads us to. It starts from the smallest daily acts, reaching for the sublime conquest of loving God above all and others more than ourselves. Duty grows and irradiates under a constantly more elevated form in each of the superior stages of humanity. The level of duty that each one of us has grows with our level of elevation. The more consciousness we have, the greater our duty. The more we know what is right and what is wrong, the more we are obligated to act accordingly. The more we grow in consciousness, the more light we invite in. As we progress, we come closer to God. Duty has three main roles: inner peace, maintenance of the order, and evolution. Peace is one of the greatest treasures that we can conquer in life. It is something that we reach through our efforts and belongs to us. We find peace when our behaviour is in harmony with our conscience. When what we do and what we know we should do are one and the same. By defining limits which should not be exceeded, duty helps maintain the order in the creation. Respecting the freedom of others, taking care that our actions are not detrimental to our neighbour. Duty promotes evolution. It is the impulse that causes us to make necessary changes. We humans tend to get accommodated easily. Once we reach a certain level, we stay there and enjoy it, avoiding further efforts. When problems come our way, it forces us to address them, to analyse our current situation and what we can do to improve. Problems are like stones that are placed in the bed of a river. When the water cannot bypass the stones because they are too high, the current is forced to rise above to pass. Likewise, problems force us to overcome ourselves, to reach a higher level in order to move on. Because the solutions to the problems we face are not found at the level we are currently at – the solutions are on the level above. In the biblical Genesis, Adam and Eve were cast out of the paradise after eating from the fruit of knowledge. When we look at the symbolism of this story, we conclude that getting cast out of a paradise is what happens to all of us once we gain knowledge. We learn something new, we gain more conscience about what is good and what is not. This new knowledge forces us to leave our “paradise” – the ways of life that we are accommodated to. Ways of thinking and acting that we used to be immersed in are no longer acceptable. We are forced to leave this zone of comfort to improve our ways and conquer higher levels. This is also the reason why it is common for people who decide to change their lives for the better suddenly face many problems. The external situation did not actually change – the people, the situations of life are the same. However, behaviours that used to be seen as good or acceptable suddenly aren’t anymore. Therefore see whether the light that is in you isn’t darkness. Seen this way, this means: be careful that the knowledge that you gain (the light in you), does not become a source of more pain, due to your failure to act according to this new knowledge! Having more conscience about what is good and what is bad, and not acting accordingly, only brings more inner unrest and a guilty conscience. Therefore, we should strive to shine more light in ourselves and take care to put it in practice in our lives. Duty gives us responsibilities. The responsibility to help those that are less evolved to progress on the evolutionary scale. To show good examples in our lives so that those on lower steps may be inspired to do likewise. This means that spirits that are more elevated than we are, have the duty to help us progress. Spirits like Joanna de Ângelis, Bezerra de Menezes, are responsible for helping us. What’s fascinating about this concept is that it is infinite. It goes from the lowest to the highest level of evolution, from the simple and ignorant spirit to the highest angels of light that are in communion with God! How wonderful, this infinite chain of solidarity among God’s creations! Each and every one of us is a part of the universal masterpiece! No matter where we are on our journey, we can make ourselves useful and help someone move forward, while others above are helping us as well. We learned that as we learn, we gain the responsibility to act well, to do good. The answer is quite direct. The fact that the bad has a greater influence in the world than the good is simply due to shyness and a lack of will! If the workers of good were more ambitious and courageous, the world would be completely different! Rossandro Klinjey made an interesting observation regarding this topic: what would happen if we created mafias of good? What would happen if we all worked for good, practiced charity and fought moral corruption with the same intensity, determination and courage as the big criminal organisations? We could do a lot more. We could change things. We could have a bigger positive impact in the world. We need to abandon the fear of being judged, leave our inertia, and start acting with more strength to serve our Master and disseminate light. The best way to have a positive impact in the world is to start by loving our family and the people close to us. We tend to look outside and try to help people outside our home, sometimes neglecting our own family. As Chico Xavier was saying, in reincarnation, “noone gets sent to the wrong address”. Our incarnations are carefully planned so that we are with the people that we need to fix things with, and with the people who can give us all the necessary support in doing so. The environment we are in is the right place for us to be. Let’s always strive to do our best possible wherever we are. This means that words are nice, but there is nothing more effective than acts. Preaching beautiful words and not acting accordingly is a bad example. Example is shown in actions. We are collectively responsible for the improvement of the planet. Each of us needs to contribute within his possibilities. For God didn’t give us a spirit of fear, but of power, love, and self-control. Let’s remember this phrase so that we can become a little more courageous and strong, daring to act out of love in our daily lives. God is always supporting and helping us. 8 For everyone who asks receives. He who seeks finds. To him who knocks it will be opened. 9 Or who is there among you, who, if his son asks him for bread, will give him a stone? 10 Or if he asks for a fish, who will give him a serpent? 11 If you then, being evil, know how to give good gifts to your children, how much more will your Father who is in heaven give good things to those who ask him! God is infinite love and might. We can always trust Him to give us the resources and support that we need. Let’s strengthen our faith. Our destiny is to be in communion with God. The path to enlightenment is inevitable for all of us. All we can do is to make the journey longer by rebelling and acting childishly. Reaching the highest level of illumination might sometimes seem like too big of a goal. The temptation to give up can be there at times. But we need to know is that God never gives us a task too big for us to carry. We always receive the necessary resources and help. We need to take it step by step. One little thing at a time. Every day a little more. It is not much, just a little bit more. Because with God, a little becomes a lot! To conclude this reflection, I would like to link to this beautifully moving video. 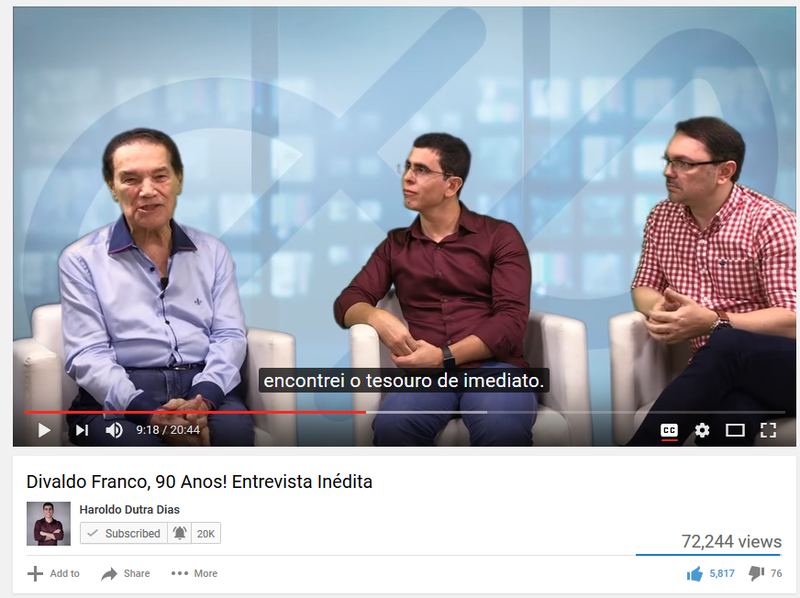 On the occasion of Divaldo Franco’s 90th birthday, Haroldo Dutra Dias organised an interview with him, together with his friend Rossandro Klinjey. It is so amazing to see these three great examples. Tirelessly working for 70 years for the well-being of mankind, Divaldo Franco explains his experience and mindset during all these years of service. One sentence that stood out for me was when he said that when he got to know spiritism, he didn’t find a treasure map; he found the treasure itself directly. And that since then, he never stopped spreading the good news and the comforting message of around the world. This is such a beautiful example of love and dedication. It motivates me to try to be a little better every day, so that I can learn to be useful and use this treasure to help in any way possible. To this, we should note that the question here is not about trying to convert others to our way of thinking. We should strive to help, comfort and enlighten when we can, firstly with our attitudes and then with our words. Let the name of the LORD be praised, now and forevermore. Not long ago I had the privilege of taking a closer look to parts of chapter 17 of Allan Kardec’s Gospel according to spiritism. Before diving into this wonderful chapter, I thought it would make sense to spend a little time on Gospel of Matthew to get some context. We are at the beginning of Jesus’ ministry, after he pronounced the beatitudes on the mount. 14 You are the light of the world. A city located on a hill can’t be hidden. 15 Neither do you light a lamp, and put it under a measuring basket, but on a stand; and it shines to all who are in the house.16 Even so, let your light shine before men; that they may see your good works, and glorify your Father who is in heaven. Each one of us has some light inside. Everyone has something good to give. Let us make our best to let our light shine, however small it might be! Every little act of goodness in our daily life is a step in the right direction. Greeting someone with a smile, saying encouraging words can make the difference and lead to more acts of goodness. 21 You have heard that it was said to the ancient ones, ‘You shall not murder;’ and ‘Whoever murders will be in danger of the judgment.’ 22 But I tell you, that everyone who is angry with his brother without a cause will be in danger of the judgment; and whoever says to his brother, ‘Raca!’[i] will be in danger of the council; and whoever says, ‘You fool!’ will be in danger of the fire of Gehenna. [i] “Raca” is an Aramaic insult, related to the word for “empty” and conveying the idea of empty-headedness. Here, Jesus goes a whole lot further than what was prescribed by the law of Moses. At the time it was given, not killing your neighbour for whatever reason was already an improvement, considering the violence that was common in these days. Jesus says that anger and aggressiveness are just as bad. 23 If therefore you are offering your gift at the altar, and there remember that your brother has anything against you, 24 leave your gift there before the altar, and go your way. First be reconciled to your brother, and then come and offer your gift. 6 How shall I come before Yahweh, and bow myself before the exalted God? Shall I come before him with burnt offerings, with calves a year old? 7 Will Yahweh be pleased with thousands of rams? With tens of thousands of rivers of oil? Shall I give my firstborn for my disobedience? 8 He has shown you, O man, what is good. What does Yahweh require of you, but to act justly, to love mercy, and to walk humbly with your God? Act justly in all situations, love mercy, and walk humbly with God. This is our goal and the way to the light, as exemplified in the life of Jesus. 27 You have heard that it was said, ‘You shall not commit adultery;’ 28 but I tell you that everyone who gazes at a woman to lust after her has committed adultery with her already in his heart. Not committing adultery was a first step. Now, we should to watch our thoughts and desires. What we cultivate within is important. This requires an inner moral transformation. 43 You have heard that it was said, ‘You shall love your neighbor and hate your enemy.’ 44 But I tell you, love your enemies, bless those who curse you, do good to those who hate you, and pray for those who mistreat you and persecute you, 45 that you may be children of your Father who is in heaven. For he makes his sun to rise on the evil and the good, and sends rain on the just and the unjust. Instead of seeking retribution and vengeance, we should do good to everyone, even when they have wronged us. For God, in his infinite patience and goodness, keeps giving us good things and waiting for our progress, despite our repeated mistakes and rebellions. 46 For if you love those who love you, what reward do you have? Don’t even the tax collectors do the same? 47 If you only greet your friends, what more do you do than others? Don’t even the tax collectors do the same? 48 Therefore you shall be perfect, just as your Father in heaven is perfect. Here we need to make a clarification: God is the absolute perfection over anything. We humans can only reach a relative level of perfection. As his creatures, we can reach the top of the ladder that leads us to a close relationship with God. But we will never be as perfect as Him. Jesus phrased it like that because the people at that time wouldn’t have grasped the nuance. “In loving one’s enemies, in doing good to those who hate us, in praying for those who persecute us.”. This way, he shows us that the essence of perfection is charity in its most ample form, because it implies the practice of all the other virtues. Vices, and even simple defects, have their origin in selfishness and pride, which are the negation of charity. The elements of true charity are: benevolence, indulgence, abnegation and devotion. Hence, our degree of perfection is in direct relation to the extent of this love, the charity that we are capable of exercising. In this amazing section, Kardec summarises the main characteristics of a good person. The list is not complete, I merely selected a few items from the section. 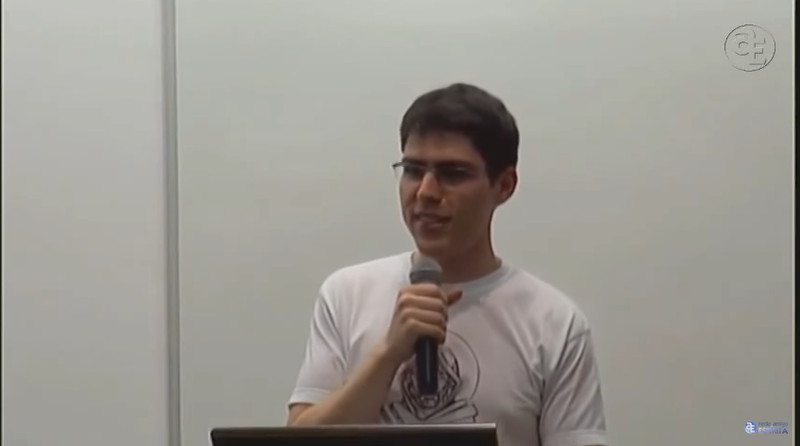 I think it is important to mention here that this is a process, we are on a road to perfection. We can sometimes feel discouraged when seeing the sublime examples of a good, perfected person, considering how far we are from it. But change takes time, we move forward step by step. We should be able to look back a few months or a few years back, compare our behaviour back then with now and see some positive changes. Interestingly, Kardec relates his experience and characterises what is good and what is imperfect when following spiritism. Spiritism, when thoroughly understood and above all when deeply and sincerely felt, leads to the results already expounded, which characterize the true Spiritist just as much as the true Christian, for they are one and the same. Spiritism does not institute any new morals; it only makes it easier for mankind to understand and practice Christ’s morals by giving an unshakable and enlightened faith to those who are in doubt or who waver. When we really integrate the values and knowledge that spiritism brings, it gives us an unshakeable faith, because it is based on reason and logic. The true spiritist can be recognised by their moral transformation and by the efforts they employ in order to dominate their bad instincts. He makes every effort to liberate himself and always manages to do this when their desire is strong and true. A true encounter with the doctrine brings about visible changes in one’s life. A change in the heart and the behaviours. If we actually make enough effort, we succeed. How many times do we stay stuck because our will is too weak? In some people, material ties are still too strong for them to be able to release themselves from earthly things. They believe in Spirits as a simple fact. But this modifies none or very few of their instinctive tendencies. The phenomenon touches them more than the morality, which seems to them to be hackneyed and monotonous. They ask only that the Spirits unceasingly initiate new mysteries[…]. Some people are more interested in the medial phenomena out of curiosity or interest. They want to get news or knowledge from the other side, without taking note of the moral changes that the communications bring. Nevertheless, the acceptance of the fundamental principles of the doctrine is the first step, from which it will be easier for them to take a second step in a future life. It is however a first step that will help their progress in the future. If this is what some are ready to accept, it is ok. More will come later. Nothing is useless, and the opportunities to learn are many. It is up to us to seize them. In these few sections, we saw how Jesus calls us to working more inside our hearts than on the outside. The times for the external rites are over. He encourages us to learn to love, forgive, help each other. Each one of us has a light that can shine and produce good things around us! Let’s start in our daily life, with small things that will contribute to making the world a better place! The ability to love and practice charity brings us forward on the scale of evolution. God is infinitely just, good and merciful! He wants our happiness in reaching the perfection that He predestined us for. Let us have a little more faith and see that everything that happens to us is a gift for our progress toward the light, even if at first it might not seem so!